Syrian cartoonists who dare depict Bashar Al-Assad's character are paying a heavy price. Earlier on August 25, 2011, Ali Ferzat, the 60-year-old famous cartoonist was dragged and beaten by three masked men, who then also broke his hands. It was only a matter of time before [Rslan] was arrested as he continued to criticize the regime and its oppression, going so far as to attack the President himself. [Rslan] did not hide and he remained in his home and at his job in the Hama-based Fedaa newspaper. 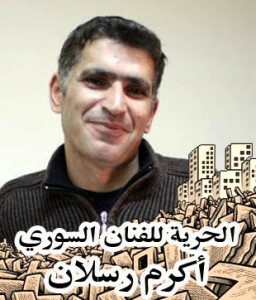 The regime eventually lost its patience with him and arrested him from his workplace on Monday, October 2, 2012. Since then, there has been no information about him. Akram Rslan, born in 1974 in Soran-Hama, is an 1996 literature graduate. He is one of the many, many members of our revolution who prefer to struggle away from the media and the limelight, and whom we know little about until they get arrested or martyred. Freedom for the artist [Rslan] Akram. Following is a selection of Rslan's work, including the cartoon (the first one) that caused his arrest. 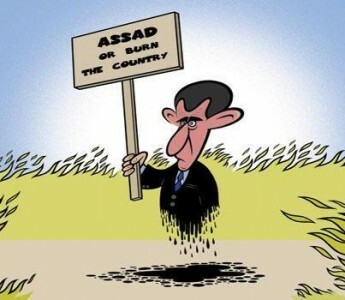 “Assad or burn the country” by Akram Rslan. The website ArabCartoon has also condemned the arrest. A campaign to free Akram Rslan has been launched on Youtube under the banner: “Freedom to Akram Rslan”. Hello there, just become alert to your blog through Google, and found that it’s truly informative. I’m going to be careful for brussels.